Every day, firefighters risk their lives as they run into burning buildings and face the deadly power of wildfires — and also as they deal with the long-term effects of smoke, soot and toxic chemical exposure. Cancer now ranks as their leading cause of death, according to the International Association of Firefighters. 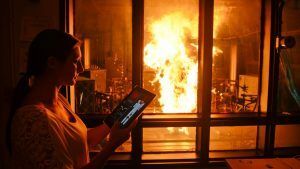 NC State experts in the College of Textiles’ Textile Protection and Comfort Center (T-PACC) are developing and testing equipment to protect the firefighters who protect us. Researchers are improving personal protective equipment: gear that keeps out smoke and soot, hoods that protect faces and necks, and fire shelters that offer the last line of defense against an approaching wildfire. When we picture firefighters, we see a distinctive helmet, boots with handles and an outer jacket. Firefighters often refer to their protective clothing and coats as turnout gear. “It’s easy to see the turnout as a uniform intended for fire protection, but with the toxic compounds released during today’s structural fires, there’s an increasing need for it to also operate in a hazmat-type capacity,” says Bryan Ormond, T-PACC research assistant professor. Although the look of firefighting gear has changed slowly, new materials and improved designs can provide better protection. Researchers have to balance competing demands. In addition to protecting against flames, turnouts need to be as lightweight as possible and allow air movement to prevent firefighters from being overcome by heat. The gear has to allow first responders to move freely while defending against sharp objects, liquid chemical residue and toxic airborne particles. Once new gear has been thoroughly tested and certified, researchers face the hurdle of getting it manufactured and into the hands of first responders. A student works in the T-PACC lab with PyroMan, a manikin designed to test gear with controlled exposure to fire. NC State, internationally known for its one-of-a-kind materials labs and textile testing facilities, puts the human element of the work first. For years, textile researchers have built relationships with firefighters who provide feedback on equipment design every step of the way. Scientists serve on national safety standards committees and partner with manufacturers for long-lasting impact. Just two years after work on the concept began at NC State, new, fully certified turnout gear with improved smoke and soot resistance went on the market in November 2017. The new turnout helps keep particulates from reaching firefighters’ skin at three junctions in the suit: the wrists, waist and ankles. NC State researchers have applied for a patent on a second version of smoke-resistant turnout gear. A commercial version of that design will be unveiled at a protective equipment show for fire departments in late April. T-PACC research brings key innovations to firefighters across the country and around the world. T-PACC scientists are in the thick of a second research project that could help end an enduring image of firefighters: the sooty face. 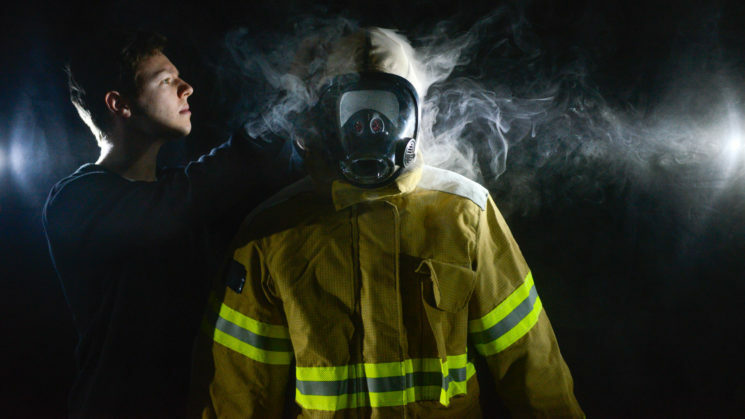 To protect the skin around firefighters’ faces and necks, researchers are working on an improved flash hood that keeps out smoke, soot and chemicals. The hood fits around the face piece of the self-contained breathing apparatus. The Federal Emergency Management Agency funded the three-year, $1.5 million hood research project at NC State through its Assistance to Firefighters Grants program. Though the hood is relatively new gear, it could limit exposure to cancer-causing agents. Compared to workers in other professions, firefighters have a 50 percent higher risk of developing testicular cancer, 30 percent higher risk for prostate cancer and 21 percent higher risk of non-Hodgkins lymphoma. NC State graduate students work on the project, which includes not only evaluating materials and designing hoods but also developing recommendations about how to select, maintain, clean and inspect protective equipment. Because the cost of outfitting a firefighter with the recommended two turnouts is $3,000 to $6,000, many departments, especially volunteer units, have to make every investment count and every piece of equipment last, Ormond says. Deadly, destructive wildfires erupt every year in the United States. Firefighting crews in the path of such power need courage, skill and specialized protective equipment. NC State textiles researchers are working to improve the one piece of gear no wildfire crew ever wants to use: fire shelters, the final defense against flames. When firefighters reach for the aluminum-coated, fabric shelters in their packs, it means wildfires are closing in, and they have only seconds to deploy the tent-like structures and get inside. The goal is to keep firefighters alive as flames rush overhead and temperatures spike. Studying how aluminized fabrics break down in the lab is only the first step, says T-PACC Director Roger Barker, Burlington Distinguished Professor of Textile Technology. To understand the conditions fire shelters must withstand, textiles researchers work with forestry experts on controlled burn tests that mimic wildfire conditions. T-PACC Director Roger Barker examines a fire shelter in the T-PACC lab. Barker’s longtime contributions to firefighter safety are well known, and many of the standards used to evaluate protective equipment were developed at NC State. In April 2017, a national network of fire service and equipment providers honored Barker for his work in building T-PACC, the only academic center with the capabilities needed to research, test and evaluate equipment for emergency responders and other high-performance textiles, all in one location. Though the work often involves simulations with sensor-filled manikins, make no mistake: What motivates NC State researchers is visualizing the faces of firefighters who will be safer because of their work.